The Marine Diver is one of Mario's special Karts in Mario Kart Arcade GP DX. The kart's body is colored light blue and is shaped like a submarine. The back of the kart has two propellers and the emblem of the character that the player has chosen. 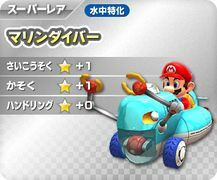 The front of the kart has two claws that seem to make small pinching motions, but they do not affect gameplay during races. The Marine Diver has alternate colors of magenta and yellow. This page was last edited on March 6, 2018, at 18:50.